This is a small Corylus avellana "contorta" that has just gone into this new pot, it should look lovely as these catkins open and become lemon yellow. Can't be long now! It would be nice to see what the tree looks like once the flowers open. 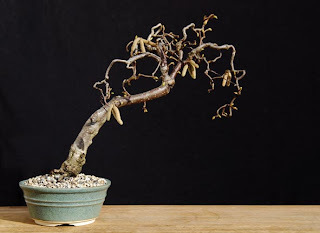 Come to think of it, I can't remember seeing a 'signs of spring' display of bonsai online anywhere. Is there one? I will post an image just as soon as it happens! Probably some time in the next fortnight. There are very few signs of spring on any of my trees yet, the only thing to have started comming into leaf is an Amur Mapple (Acer ginnala) sapling and that is native to some very cold climates (the Amur siver valley in Southern siberia for example). As for other sites, I'm sure Walter Pall will post images just as soon as buds begin to extend.